Southern Illinois University Carbondale computer science senior Ayush Kohli, seated, and Amiangshu Bosu, assistant professor of computer science, work in a computer lab. Kohli recently won third place at the Association of Computer Machinery’s Student Research Competition world final, a prestigious, international event, featuring the work of 17 regional ACM student research competition champions. Our mission statement refers to “innovation in research and activity” and “nurturing student success.” We accomplish both through emphasis on student research. In fact, studying at a major research institution confers a wealth of benefits upon our students. They are constantly pushed to explore real-world problems and come up with practical solutions. The result is a level of leadership and innovation that never fails to impress. For instance, two Salukis were recently recognized for their creations. 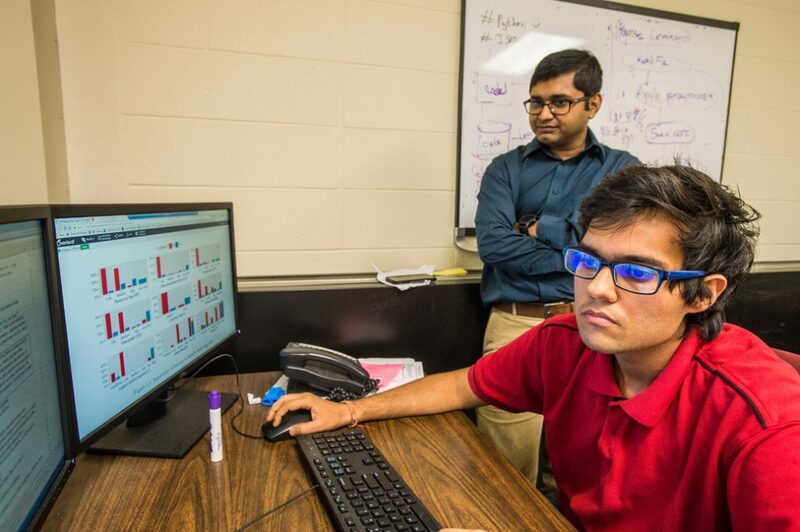 Ayush Kohli, a senior earning a degree in computer science, earned an award from the Association of Computer Machinery’s Student Research Competition for an app he designed. The app, DecisionDroid, uses machine learning to help identify malicious and pirated apps for Android devices. Tessa Barnes, a junior in industrial design, gained recognition for her design of a prosthetic device that could be used by musicians to play brass instruments. Her device would give its users much better mobility than similar devices currently on the market. SIU students were at the forefront of the discovery of a new American fort on the site of Fort Kaskaskia. Archeology classes have been conducting hands-on research in the area since last year, and had trouble reconciling their findings with the historical record, which said that U.S. troops inhabited a French fort five decades after it was abandoned. This year, they found that the U.S. troops had, in fact, built a completely new fort approximately 300 meters from the French fort. The discovery opens a whole new avenue of research on the site. These are just a few examples of the recent contributions SIU students have made. Our campus is full of inventors, entrepreneurs and leaders. I’m excited to hear about the next big breakthrough.